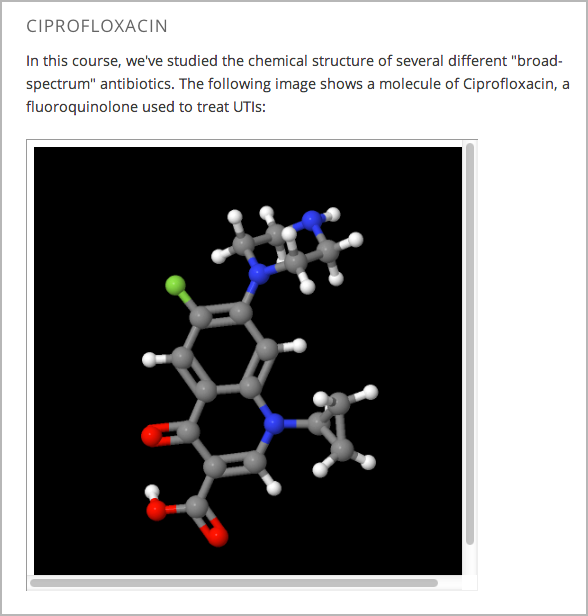 Studio offers two tools that you can use in discussions of molecules. With the molecule viewer tool, you can create three-dimensional representations of molecules for students to view. With the molecule editor problem type, you can allow students to draw their own molecules. For more information about this tool, see Molecule Editor Tool. The following image shows the molecule viewer tool in a course. To create a molecule viewer tool, you must have permission to upload files to a third-party file hosting site such as Amazon Web Services Simple Storage Service (AWS S3). When you create the molecule viewer, you’ll upload a folder that contains a large number of files to the file hosting site. Creating a molecule viewer tool has several steps. Download files from the BioTopics website and from edX. Move or edit some of the files that you downloaded. Upload a folder that contains all of the files that you downloaded and edited to your own file hosting site. Create an HTML component that contains an iframe element in Studio. The iframe references the files that you upload to the file hosting site. Create or download a .mol file for the molecule that you want to show. You can download a variety of .mol files from the BioTopics website. Save the file in a place where you can easily find it. Download the MoleculeViewerFiles.zip file from edX. Unzip the MoleculeViewerFiles.zip file that you downloaded. When you unzip the file, it contains a MoleculeViewerFiles folder with the following folders and files. Move the .mol file that you downloaded from BioTopics into the data folder that you downloaded from edX. In a text editor, open the MoleculeViewer.html file. script: "set antialiasDisplay; background black; load data/Glucose.mol;"
Make sure that your MoleculeViewerFiles folder contains the following folders and files. data (folder): Earlier, you added a .mol file to this folder. MoleculeViewer.html (file): Earlier, you changed line 19 in this file. Upload the entire MoleculeViewerFiles folder to your file hosting site. Because this folder contains many files, uploading the folder may take several minutes, even over a fast connection. In Studio, open the unit where you want to add the molecule viewer. In the component editor that opens, replace the existing content with your own text. In the toolbar, select HTML. In the HTML Source Code box, enter the following line in the place where you want the molecule viewer to appear. Replace path_to_folder with the URL of your file hosting site. The revised line might look like this example. Select OK to close the HTML Source Code box, and then select Save. Select Preview to see your component as a student would see it.